Super average leather brown clunkers, but with pentacle-esque stitching. Like the Christine O'Donnell witch malarky, in shoe form. The whole collection carried those kinds of motifs, which I loved except for when it got reminiscent of 7th grade notebooks. 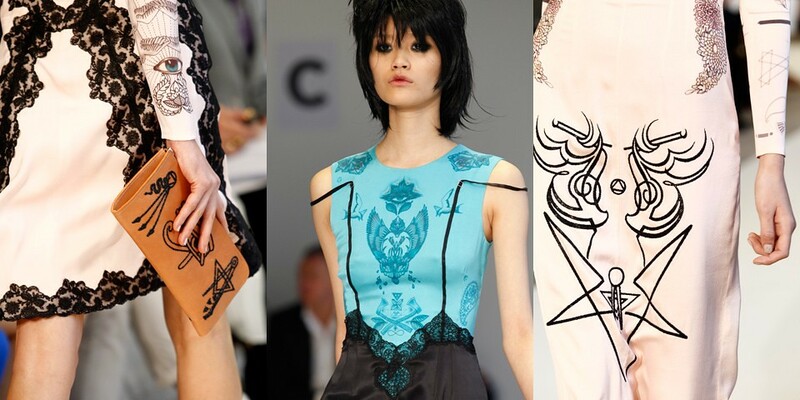 Eyes are awesome, pentacles are awesome, but wings and paisley are a bit too temporary tattoo-y and took away from garments that otherwise would've been way more intense. I got more excited when the same effects were made using the fabrics themselves, especially in leather form. Even though I'm really feeling witch vibes for the weather we're currently having, associating that kind of darkness with fall would be pretty obvious. Like the occasional use of brown leather as opposed to black, applying the gloom to sunnier days allows the pastel/witch contrast to reach a less simplistic place. This made the last look one of my favorites: a light, pure, modestly long slip held together by a caramel harness.